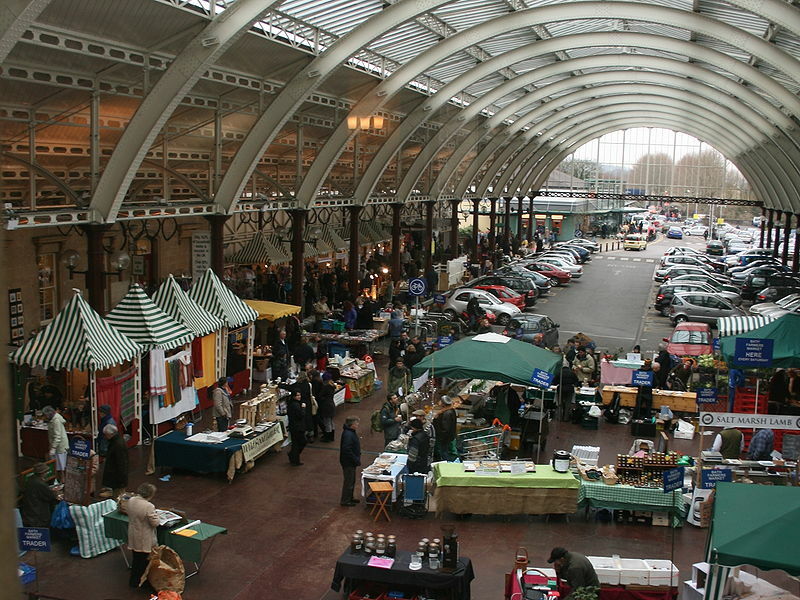 Green Park station was opened in 1870 as the terminus of Midland Railway's Mangotsfield and Bath Branch Line. The station buildings were designed by the Midland Railway architect John Holloway Sanders. The station is on the north bank of the River Avon. The locomotive shed was about half a mile from the station to the north side of the main tracks. The goods yard was on the opposite side of the tracks from this.Originally named Queen Square station, it was built in an elegant style which blends well with the Georgian buildings around it and includes a vaulted glass roof in a single-span wrought iron arch structure.The platform accommodation in the station was modest, having an arrival platform and a departure platform, with two sidings between them. The siding adjacent to the arrival platform was equipped with ground frame points to release an arriving train engine. The Midland Railway's Bath branch had opened in 1869, but the river Avon bridge and the new station were not ready, so for a year the terminus was at a temporary station to the west of the river. 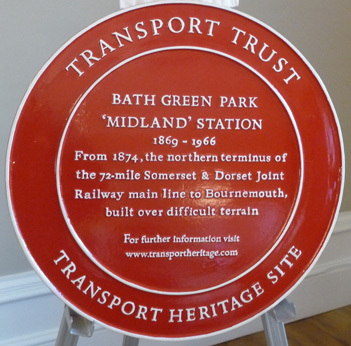 When the Somerset and Dorset Railway completed its Bath extension line in 1874, they connected into the Midland line at Bath Junction via the newly constructedMidland Bridge, a half mile outside the station, and in friendly co-operation with the Midland company they used the station. This created considerable additional through traffic, and as well as heavy volumes of freight, through passenger journeys from the Midlands to the South Coast were created. Through trains had to reverse at Bath, and the most famous of these was the named Pines Express from Manchester (and at times other northern originating points) to Bournemouth West. 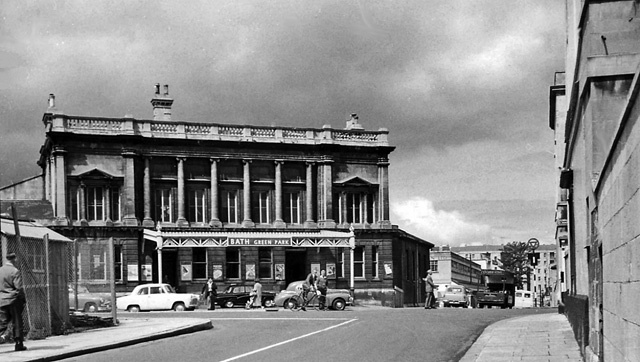 Queen Square station was operated by the Midland Railway. At the grouping it passed to the London, Midland and Scottish Railway. 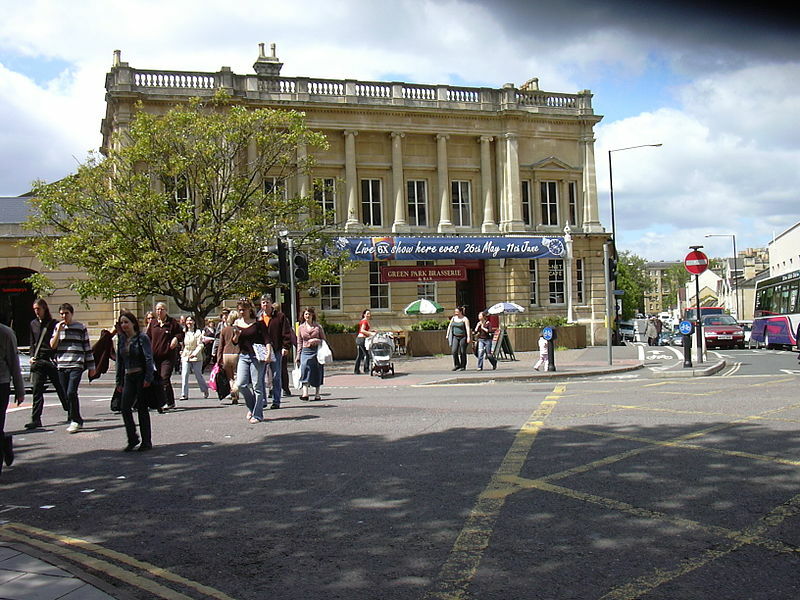 For almost all of its life, it was usually referred to as Bath Queen Square station, after the prestigious square about a quarter of a mile away. It became Bath Green Park under British Railwaysin 1954, and still bears that name today. 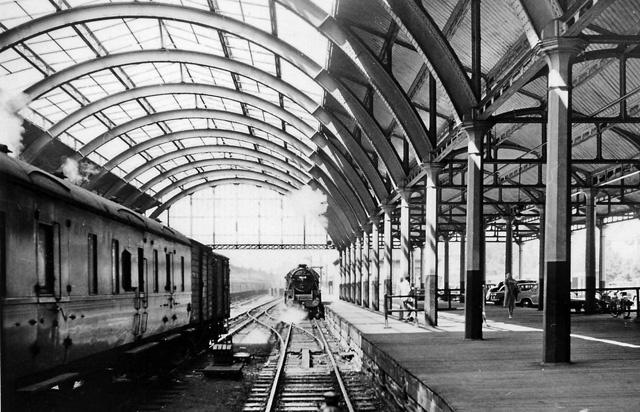 Parts of the distinctive glass roof were damaged during bombing raids in April 1942, and the glazing was not re-instated during railway usage after the war. The atmosphere of the station was always powerfully nostalgic, and at most times of the day a short local train could be seen simmering in the platform waiting for departure time. On summer Saturdays the station became very busy, passing numerous holiday trains between northern towns and Bournemouth; all of them had to be reversed in the station. Ordinary services were local Midland trains to Bristol St Philips and Clifton Down, later to Bristol Temple Meads, and S&D trains to Templecombe and beyond.